September is quite the month! We have already talked about Happy Cats, Guide and Service Dogs and Pet Insurance as celebrated month events. There are still a couple to go. 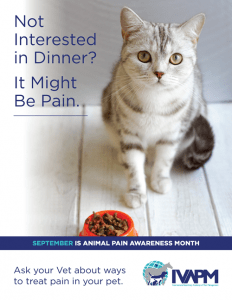 This article focuses on Animal Pain Awareness Month. 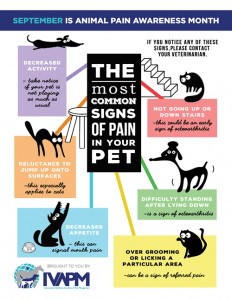 The International Veterinary Academy of Pain Management (IVAPM) educates and informs pet owners about their pet’s health and well-being when it comes to pain management, be it acute or chronic pain. 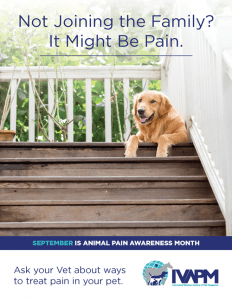 IVAPM has proclaimed September as Animal Pain Awareness Month, and this coincides with human medicine’s Pain Awareness Month. Animals suffer from pain just like people do. Pain comes in many forms: surgical pain, arthritis and cancer related pain, just to name a few. Acute pain is obvious and distressing. Chronic pain can be subtle, and masked as “getting old” or “slowing down.” Old age is not a disease, but pain is. There are many options to treat the various causes of pain in animals including pain medications, physical rehabilitation, acupuncture, laser therapy, and therapeutic massage.